The recent cooler, wetter winter led to a rise in lush vegetation. 22.08.2015 - However, this has subsequently been dried out by several heatwaves, increasing the risk of forest fires this summer. In Gran Canaria, the island government once again specifically issued an urgent warning to all residents. The use of circular saws and welding equipment in the summer has been prohibited in areas near to woods or forests, or surrounded by agricultural land. Despite this ban, the use of these tools is currently the number one cause of fires in Gran Canaria. Santana believes that public awareness is vitally important. Five years ago, the burning of organic remains of plants or the building of small campfires were the main causes of forest fires. However, because of the targeted awareness campaigns that have been conducted since then, this risk has now decreased to the point that it now only occupies fifth place on the dangers’ list. The perpetrators always believe they have everything under control. "This is the same phrase that drug addicts use again and again. And recently we had one day when we had to extinguish two fires generated by these devices”, he explained. This also shows the importance of using the fire brigade for the study of forest fires. The employees make a clear list of the main reasons for the fires, so they have concrete information on which to base awareness campaigns. Anyone who is not sure which equipment can be used on their premises is advised to ask in advance at the fire brigade. Even some approved activities have a certain risk level, such as the proper burning of crop residues. 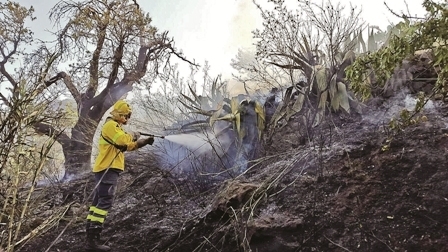 Arson has also increased again this year in Gran Canaria. The experts do not believe these activities are carried out by a sick pyromaniac, but by people who believe in regenerating new pastures for their herds, or those who commit acts of revenge over land disputes and the like. Due to the acute danger of forest fires, the island president Antonio Morales and the island’s civil and environmental protection officer, Juan Manuel Brito, asked the public to pay the highest attention at all times and be prudent in natural areas and in their immediate zone to prevent tragedies which could also possibly affect humans. Paradoxically speaking, the less it burns, the more dangerous it is. This especially applies where there is a lot of dry vegetation, which provides plenty of fuel and speeds up a forest fire, making extinguishing it extremely difficult. This was the case with the worst fire in the Canary Islands, which plagued Gran Canaria in 2007. Every individual can play his part in protecting the forests and nature, either as residents or as visitors, and that's what everyone who is in the mountains and forests during the summer should do. Although this particular information campaign came from the Gran Canaria island government, it is equally valid for the other forested islands. Produced with news.CMS in 0,0823 seconds.